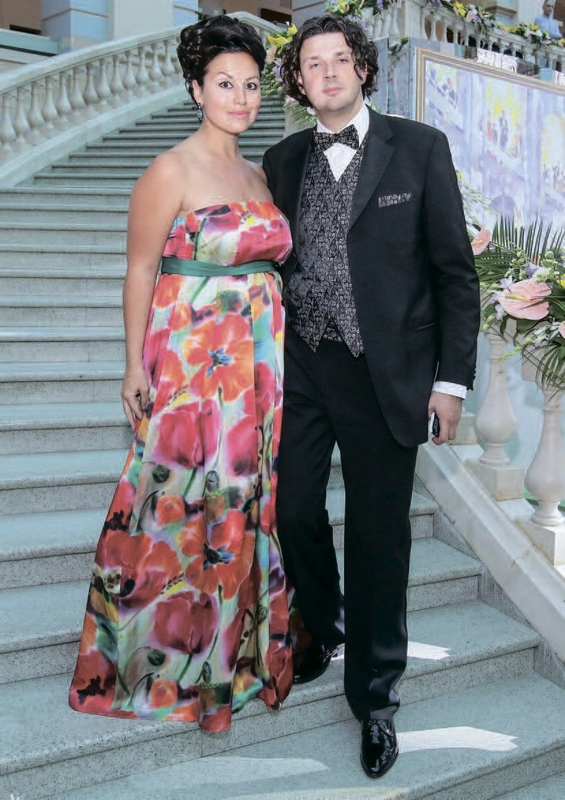 On the 6th of June in Moscow there was held the 13th Vienna Ball, in which Alexandra OTIEVA took part, presenting her picture "The Bay" in soft pastel colours for charity auction. Ahead she will take part in the events of the Year of Russia in Monaco. The nearest and future plans will be discussed in our conversation with the master of watercolours. 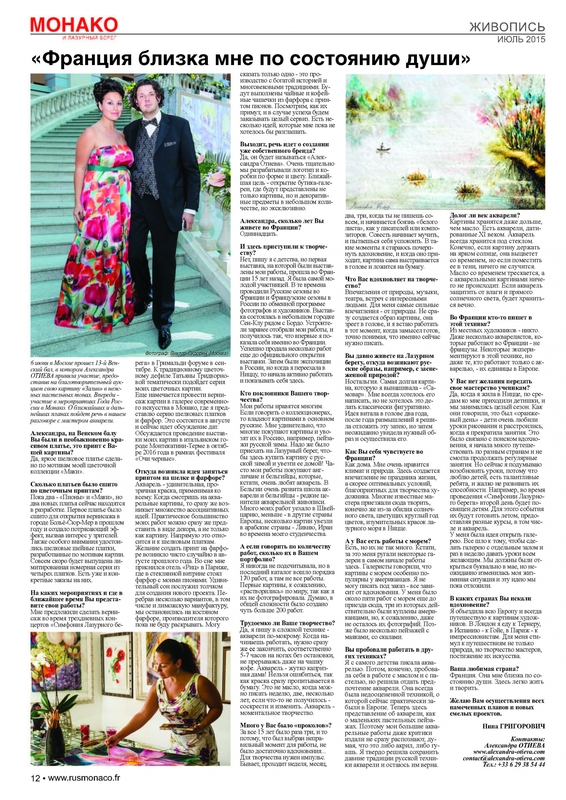 Alexandra, at the Vienna Ball you wore unusually beautiful dress in bright floral printing. Is it the print from your picture? Yes, this bright silk dress is made themed on my painting "Poppies". How many dresses were made using flower prints? Up to now there are two – "Peonies" and "Poppies", but two new dresses are now under development. The first dress was sewn for the opening of the vernissage in Beaulieu-sur-Mer last year and created a stunning effect, provoking interest from the audience. Also, special attention was given to silk neck scarves, designed on the motives of the paintings. Very soon a limited collection of four scarves will be released. There are already specific orders for them. At what events and where will you present your works in the nearest future? I was invited to make a vernissage during the three-day concerts "Symphony of the Cote d'Azur" in the Grimaldi forum in September. 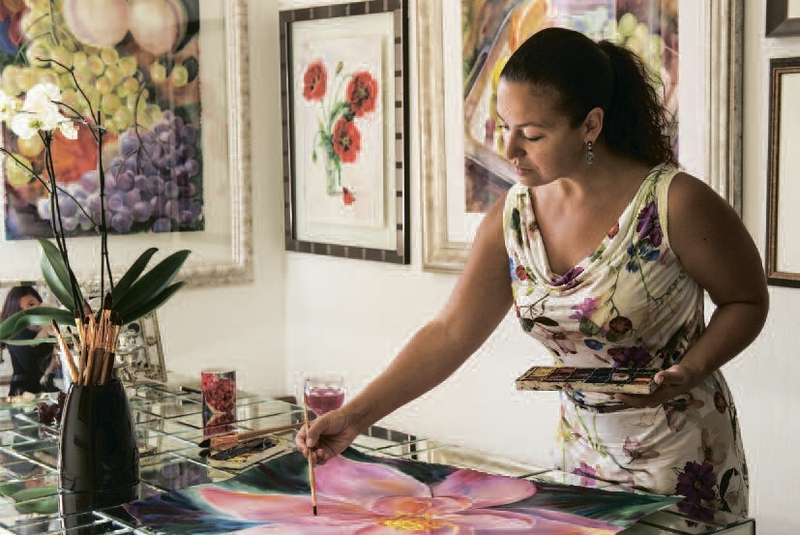 A series of my floral paintings will suit Tatiana Tridvornova's traditional floral show. It is also planned to hold a vernissage of paintings in the Gallery of Modern Art in Monaco, where I will exhibit a series of silk scarves and porcelain. It will take place in August and now there is a discussion of the dates. The exhibition of my paintings in the Italian city of Montecatini Terme in October 2016 in the framework of the festival "Dark Eyes" is under discussion. What was the reason to start designing prints on silk and porcelain? Watercolour is an amazing, transparent paint, applicable to everything. When you look at watercolour painting, you at once have a lot of associations. Most of my works are of a decorative nature and not simple paintings. This is the case with silk scarves. The desire to work with a floral design on porcelain appeared accidentally in August last year. I had a dream: the hotel "Ritz" on the Place Vendôme in Paris, where in the glass window there were exhibited items made of porcelain with my peonies on them. This dream was the impetus for the new project. Having studied several variants, including Limoges porcelain, we stopped on bone china produced by the factory which name I would not give yet. I may say that it is a well-known porcelain factory having a great history and traditions. There will be tea and coffee cups with the Peonies print. We will look at the reaction of the audience and maybe make an order for a full set. There are several ideas which I am not ready to disclose yet. Yes, it will be called "Alexandra Otieva". We have been choosing the forms and colours of logo and packages very carefully. The main goal is to open a boutique-gallery, where not only my paintings will be presented, but also exclusive decorative items in small quantities. Alexandra, for how many years do you live in France? And you started to work here? No, I've been painting since my childhood, but the first exhibition where my works were exhibited was held in France 15 years ago. I was the youngest participant there. In those days, Russian seasons were held in France and French seasons – in Russia under the exchange program for photographers and artists. The exhibition took place in a small town of Saint-Cloud near Bordeaux. The organizers selected my works in advance, and it turned out that for the first time I showed myself in France. I successfully sold several works before the official opening of the exhibition. Then there were expositions in Russia, but when I moved to Nice, I began to work actively and expressed myself here. Who are the admirers of your work? Many people like my work. If we talk about collectors, then they are mostly Russian. It seems amazing to me that many people buy paintings and take them to Russia, for example, the landscapes of Russian winter. They come to the Cote d'Azur, here buy pictures of the Russian winter and take them home! Often my works are bought by the British and Belgians, who, incidentally, are very fond of watercolour. In Belgium, the school of watercolours is well developed and the Belgians are the connoisseurs of watercolour painting. Many of my works went to Switzerland, less – to other European countries, several paintings from n the days of my studentship were taken to Arab countries – Libya, Iran. And if we speak about the number of works, how many of them are in your portfolio? I never counted them, the last catalogue included about 170 works, but there are not all of them. The first pictures, unfortunately, "dissolved" all over the world, since I did not take any photos of them. I think a total of about 200 works were created. Yes, I use a very complicated technique – watercolours on the wet sheet. When you start working, you need to finish it immediately, it takes 5-7 hours standing, without any breaks, without interrupting even for a cup of coffee. Watercolour is a very capricious thing! This is not as in the case oil paints, when you can paint for a week, two weeks, several years, and scratch off your mistake and change the picture. Watercolour is an instantaneous art. Did you have a lot of "missteps"? For there have been three of them during 15 years, because the wrong moment was chosen for the work, there was not enough inspiration ... An impulse is necessary for creativity. It happens that one cannot paint at all during a week, a month, two, three months, and the fear of a "white sheet" begins, like it is with writers or composers. Conscience begins to torment you, and you try to calm yourself. At such times I try to draw any inspiration, and when it comes, the picture itself is formed the head and then imprinted on the paper. I draw it from nature, music, theatre, meetings with interesting people. For me, the most powerful impressions are those received from nature. An image of the picture is not created immediately, it ripens in my head, and I set to work at that very moment when the idea is ready, knowing exactly that it's the time for starting the work. Nostalgia. The picture that took the longest period of time was "Samovar." I always wanted to paint it, but I did not want to do it classically, in a figurative way. The idea was in the air for about two years, after a year of reflections I decided to postpone the implementation of the idea, but then I saw the right image and implemented it. I feel at home. I really like the climate and nature. Here there is not the Feast of life, but optimal conditions for creativity of the artist. Many famous masters came here to create because of the abundance of sunlight, all-year-round blooming of flowers, amazing colours of the azure sea in Nice. Do you have any paintings with the sea? I do, but not so many. By the way, I was scolded for this by some galleries at the very beginning of my career here. Gallery owners said that the pictures with the sea are especially popular among Americans. I can not paint against order – it all depends on inspiration. I had about five works with the sea before coming here, three of which were actually bought by the Americans, but, unfortunately, not even their photographs were kept. Later on there were several landscapes with lighthouses or rocks. Have you tried working in other techniques? I paint with watercolour from the very childhood. Then, of course, I tried myself in working with oil and pastel, but decided to give preference to watercolour. It has always been an underestimated technique, which is now almost forgotten in Europe. 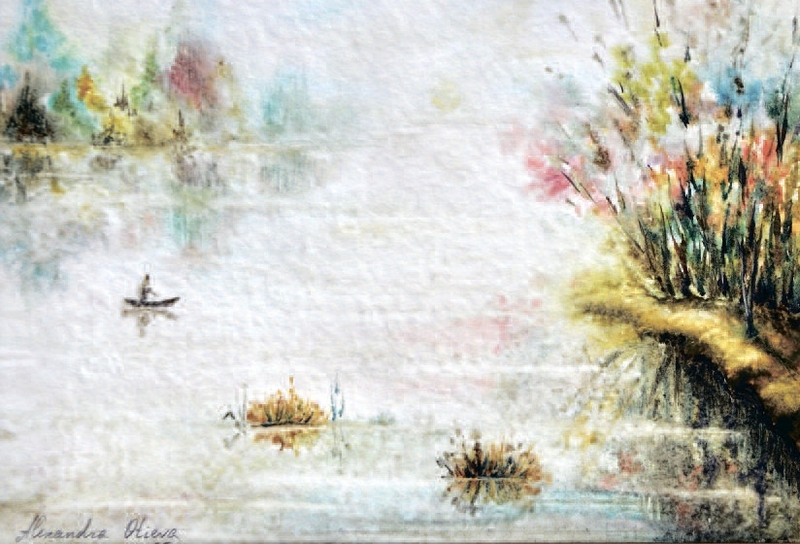 Now the idea of ​​watercolours is associated with small pastel landscapes. Therefore, even critics do not immediately recognize my large watercolour works distance apart, thinking that it is either acrylic or gouache paint. I am dead set to keep the old traditions of Russian watercolour technique and I remain devoted to it. Is the life period of watercolour short? Watercolours are stored longer than oil paintings. There are some works from the 11th century. You just need to know how to keep it. Watercolours are always kept under glass. Of course, if the picture is kept in the bright sun, it will fade with a course of time, but if you put it in the dark pace nothing will happen. Oil cracks, but nothing happens to watercolour paintings. If the watercolour is protected from moisture and direct sunlight, it will be stored forever. There is no one among the locals. Even a few watercolour painters who work in France are not French. Some people experiment with this technique Across the whole Europe, there are very few such artists who work only with watercolours. Yes, when I lived in Nice, on Wednesday kids came to me and we had our lessons during the whole season. As they said, it was an "orange day" – the children were very fond of drawing lessons and were upset when I stopped teaching. This was due to the search for inspiration, I began to travel a lot to different countries and could not continue regular classes. But now I'm thinking of starting lessons again, because I love children, there are talented ones, and it's a pity not to develop their abilities. For example, during the "Symphony of the Cote d'Azur" the second day will be dedicated to children. They will be prepared for this event in the summer, different courses, including watercolours, will be provided. I had an idea to open a gallery. It looked like we would open a gallery with a separate hall and give lessons to all the visitors once a week. It was supposed to be opened in May, but my life situation suddenly changed and we have postponed this idea so far. In which countries did you seek your inspiration? I travelled all over Europe and always travel to pictures of artists. In London, I'm going to Turner, in Spain – to Goya, in Paris – to the Impressionists. For me, the incentive to travel is not only nature, but the work of masters, comprehension of their art. France. She is congenial to me in a state of mind. It's easy to live and create here.